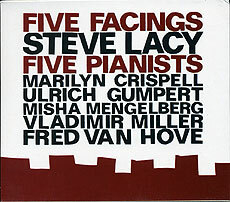 Steve Lacy, soprano saxophone; Marilyn Crispell, piano (tracks 1, 2); Misha Mengelberg, piano (tracks 3, 4, 5); Ulrich Gumpert, piano (track 6); Fred Van Hove, piano (track 7); Vladimir Miller, piano (track 8). Recorded 4-8 April 1996 during Workshop Freie Musik, Akademie der Künste, Berlin. Prevoiusly released as FMP CD 085 in 1996. Design (front cover reproduced above) by Klaus Untiet.